To celebrate the 25th anniversary of Sonic, this hack improves the NES version of Sonic The Hedgehog, making it more playable and enjoyable. Most Sega fans would have said they vastly preferred the Genesis version, but I think this NES version would have sold quite well back in the day. could this be put on a actual cart? I agree. This was really well done, particularly for a bootleg. It gets even better though. Since the OP, the game's music and graphics have been improved even more. The music improvement stands out the most, especially impressive for an NES game. 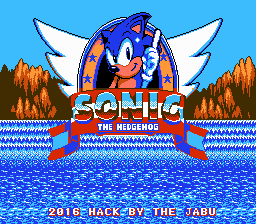 Sonic NES 'Improvement' by The Jabu. Music and Graphic update hacks by Sics and Ti. If you have a sharp enough eye, you should see a slight, but noticeable difference in the title screen graphics.